Traditional ceremonies for marriage in Japan are usually only attended by small groups of family members and close friends. The bridal couple wear special silk wedding kimono – for the bride, the elegant shiromuku (white kimono) or the luxurious iro-uchikake (coloured kimono), and for the groom, formal black montsuki (family crested) kimono with hakama (wide-legged pants). The Shinto religion is native to Japan and this style of wedding is most common amongst Japanese people. Shinto is based on respect for both nature and life, and Shinto shrines are often set amongst cherry blossom trees and other picturesque Japanese flora. The elaborate ceremony, conducted by a Shinto priest, involves the couple exchanging ritual cups of sake to symbolize their union, as well as offering small branches of the sacred sakaki tree to the Shinto deity. Ceremonies take 30 or so minutes and are usually followed by a meal, either at the shrine or a nearby restaurant. 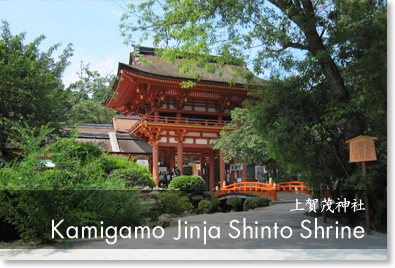 Each shrines and a temple have a different price of photography fee in the precincts and a carry-on dress fee, etc. There would be corkage fee if you are taking in your own photographer and/or costumes for the wedding. 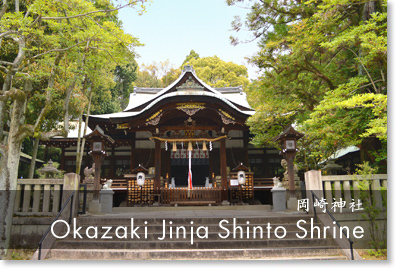 Please contact directly if you are interested in having a ceremony at a shrine other than Okazaki Shrine or Kamigamo shrine. most shrines require the bridal couple to wear wedding kimono.